Lamp from IKEA, where else, I mean c’mon! iPod and docking station, this is used more than you would think. I use it to play audio books when I’m struggling with sleep and my monkey mind is chattering away. I listen to the words and try to write them in my head, this helps me drift back off again if I wake up in the wee hours. I also listen to music when I’m pottering and cleaning upstairs. Gratitude journal. I don’t write in this as often as I ought to, you’re supposed to list 5 things that you noticed each day. I’m listing it first amongst the books, to prompt me to get back in the habit. Exercise and well-being journal. A birthday/Christmas present from my best friend, it’s a Moleskine, gorgeous and I am taking great pleasure in noting what I eat, what I do when I exercise and listing recipes, articles and anything else that tickles my fancy. Mapp & Lucia, EF Benson. I cannot tell you how much I love these books, I always have one of the 2 omnibus volumes beside my bed all the time. My granny used to read them, some are set in my favourite place in the whole world, Rye, and for sheer silliness, snobbery and escapism, they can’t be beaten. Also, Noel Coward and Nancy Mitford loved them too, so who can argue with that recommendation? Mini note-pad and pen. You know when you wake up with a ‘OMG! Musn’t forget? !’ That is precisely why I keep one in my bag at all times too. Glasses, on account I is blind without them. They have to go on so I can walk around of a morning. Dumbo. This is my oldest toy, and one I took in my hand baggage when I emigrated. Made for me, he was waiting in my cot when I came home from hospital. 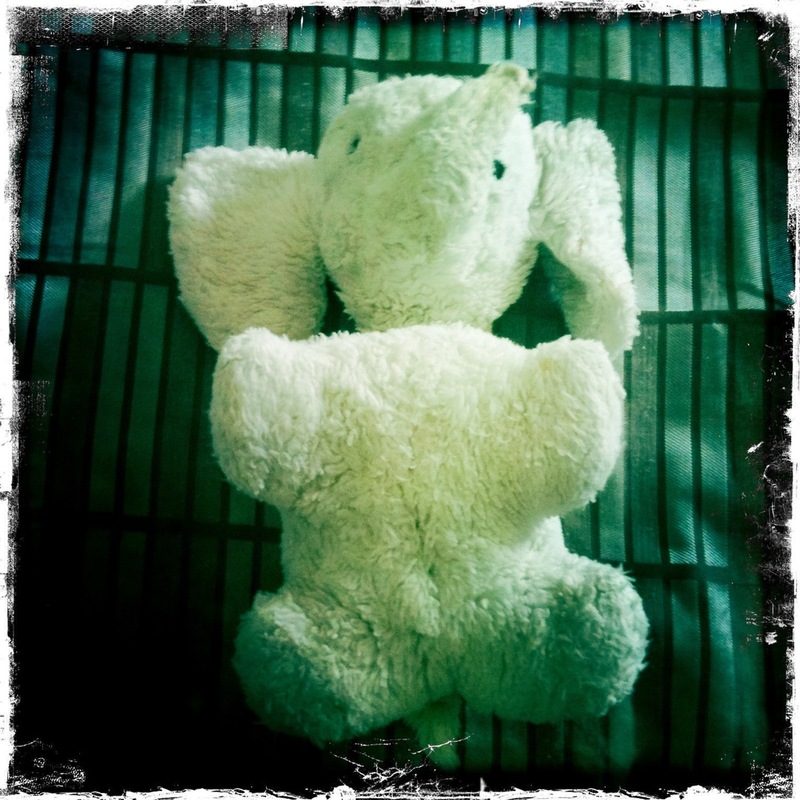 A white elephant, that I occasionally wake up to of a morning. Which means I had a restless night, or nightmare. Mum had to prise him out of my arms to wash him, and I can remember coming home from school to see him hanging up on the line, by his ears and shrieking with horror. Here it is, all tidied up and dusted. Please note the extra two pillows I’m now propping myself up on to sleep and I’m not even out-to-here pregnant. The box Dumbo is residing on holds our nightlight candles (also Ikea), I like having them upstairs, great for an impromptu candle-light nookie, or lined up around the bath. 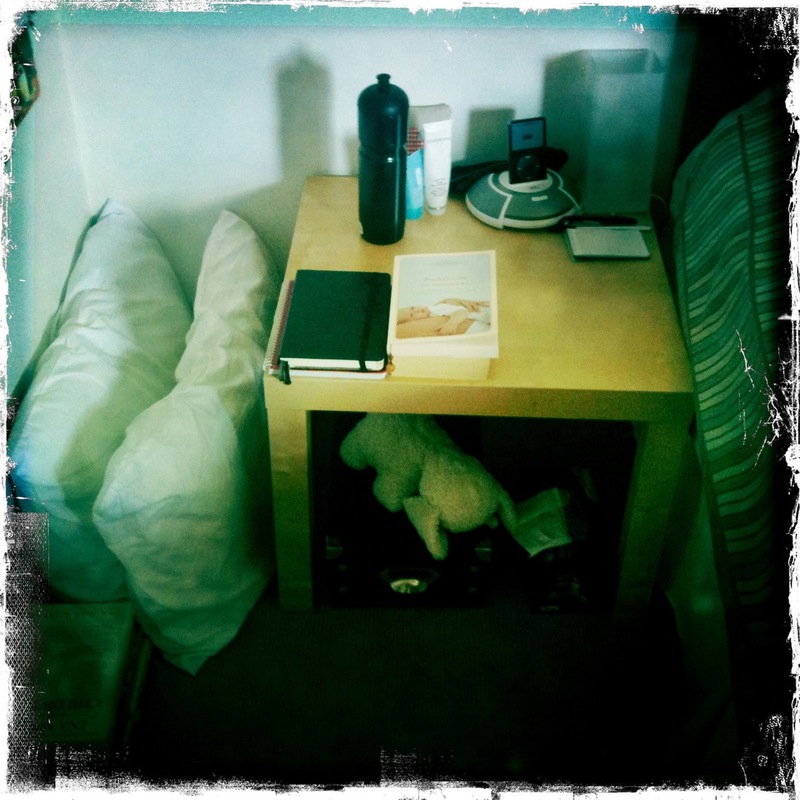 In front of the pillows is also another stack of books, pregnancy and birth related. We’re keeping them in the bedroom, because they’re handy reference material when we get into bed and start talking over our day. It also meant when we were reading them originally, if I left them upstairs, I was less likely to leave them around for visitors to find! You may have noticed that I’ve not included my Kindle in this list, as I’ve also got a litre sports bottle of water that gets topped up nightly on the table; the last thing I want to do is drench it with water. I am also debating naming said Kindle. It’s quite amazing the schwarm I have for this gadget. Dare I say it? Much more than my iPhone, but about equal with my iPod. Engraved on the back of the iPod I paid for: ‘I worked hard for this!’ I still look at it and grin, remembering when the box arrived at work. Anyone else out there named their Kindle, or is that a leetle bit too weird? Seeing Dumbo again was like a little bolt from my childhood, I don’t think I’ve held him since before you first moved out, yet right now, my hands have the sense memory of exactly how he felt. I never knew a blog with such an unpromising title (meant in the best way possible!) could have such a tangible impact.